All USTA members receive 10% off apparel. Special Offer for USTA League Captains; 10% off apparel and accessories (final sales not included). 10% off all single service sessions for USTA members. 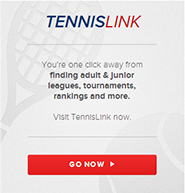 Special Offer for USTA League Captains; use coupon code USTA20 at checkout and receive a 20% discount. Affordable fashion jewelry personalized to your style. VaVaVoo will donate a portion of sales to benefit CTA tennis programs. Use code USTA for 20% OFF and to benefit CTA.